Also known as Peninsular Rock Agama, South Indian Rock Agama is mostly found on rocky hills of south India. Its scientific name is Psammophilus dorsalis and it was discovered by J. E. Gray in the year 1831. It belongs to the family of agamid lizards. Male South Indian Rock Agama during breeding season. Photographed by Mohd Abubakr. The male rock agama is usually pale brownish to black colored. 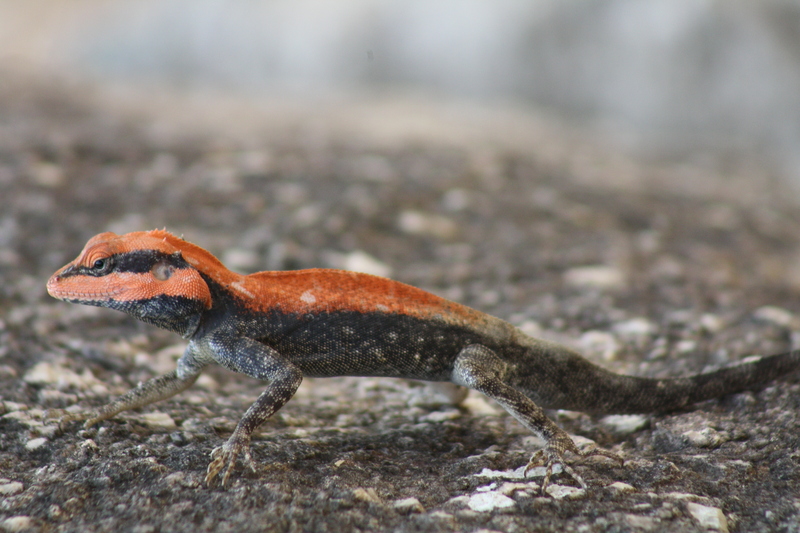 The color pattern of their body resembles the rock pattern thus giving them the name, ‘rock agama’. However during breeding season it assumes bright colors like red and black. The females are olive-brown in color with white-colored spotted lines along each side of the back. The average length of male rock agamas is 235 mm (i.e., from snout to the tail) whereas the females are smaller.